Zodiac Arts is a unique organisation that fills a gap in the market for sports and recreation for people with learning difficulties and disabilities particularily wheelchair users. 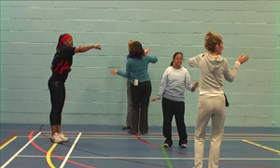 We run special needsand mainstream sports workshops in London and the UK. We use equipment designed for mainstream sports and recreation activities as well as ordinary everyday items and adapt and tailor make them for individual clients with special needs. We offer our expertise to agencies in that sector. Our creativity and adaptability allows us to make use of anything around us to enable people with special needs to gain the most they can from physical activities. Our aim is that clients and carers through using our sports activities can interact and do things together so both will benefit. Many times we have noticed carers unsure of what to do when attending a session with their clients. We offer our expertise in the form of workshops for agencies in that area as well as for carers and parents. I have developed role-play activities simulating manoeuvres choreographed around sport, for example reaching, jumping, throwing, pushing, placing objects, co-ordination skills and concentration. Play is a very important part of our social development in order to explore our boundaries and to make decisions, no less so for people with learning difficulties or disabilities. Therefore at this stage wedon’t focus on the rules in sport. We introduce individuals into a game of their choice the aim being for them to improve their motor skills and have fun. 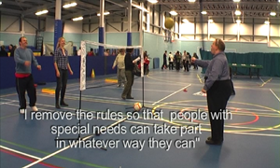 Having fun is what is important so I use the basic concepts of well known games Such as Table tennis, Basketball and Boccia and remove the rules so that people with special needs can take part in whatever way they can. 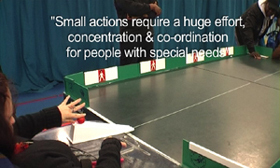 Sometimes with help they may manage to put a ball onto a ramp and then see it roll towards a target These small actions require a huge effort, concentration and co-ordination with people with special needs. The activities work because they are fun and manageable giving them a sense of achievement. Those that show potential and demonstrate an increased level of motor skills and competence are encouraged to follow rules & techniques of the games. In some cases we direct them with support into mainstream sport centres, or teams that specialize in their chosen sport. I arrived at my philosophy and techniques through observing in my sessions over the years people with learning difficulties and disabilities and seeing what was needed to enhance and improve their quality of life and develop their motor skills. Through my martial arts training, I have come to understand that the meaning of Kung fu which can sum up the philosophy behind our work with special needs. This is a general term in Chinese martial arts, translates as skills obtained through hard work, or time well spent. A game played with 6-seated players designed for wheelchair users. Placing cones at different angles and distances will improve aiming technique. Players can use a ramp if they are unable to throw the ball at the target.may also take part in the game. Green Wheel can be mounted onto a wall or laid down flat on the ground and objects with a Velcro texture can be thrown at the target to gain maximum points.Wheelchair users and more mobile players can be placed at different distances according to their ability coordination and accuracy. 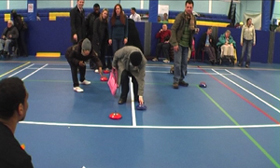 The Curling stones use ball bearings to glide over a smooth surface and pushed to the target area. This is ideal to get inactive people active. equipment designed to be free standing no more than 3 feet high from the floor or placed on a table.This makes it reachable. 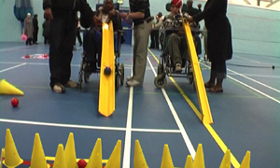 is modified cricket for all players with a severe or minor disability. This is played on a table tennis table with the boundaries, six’s fours, fielders and all the thrills of the game. Practicing Volley Ball, Hitting the ball over the net with the other player returning the service is an achievement by it self. By lowering the nets wheelchair users may also take part in the game. We encourage everyone to try a new sport and monitor his or her improvement.